Home-made pastry pockets stuffed with mildly spiced vegetables. Roughly cut onion dipped in mildly spiced chickpea flour and deep fried. Vegetable patty battered in mildly spiced chickpea flour and deep fried. A combination of the above three served as an entree platter enough for two people. Tender pieces of chicken marinated in spices, skewered and cooked in the tandoor oven. Tender diced chicken marinated in chef’s special spices and cooked in the tandoor oven. Dairy & artificial color free. Spiced mince of lamb pressed on a skewer and cooked in the tandoor oven. Succulent lamb cutlets marinated in spices cooked on skewers in the tandoor oven. A combination of four of the above scrumptious meat delicacies served as an entrée platter enough for two people. A combination of two pieces each of Vegetable Samosa,Vegetable Pakora, Chicken Tikka and Seekh Kebab served as an entree platter enough for two people. Fresh button mushrooms marinated in yoghurt and spices cooked in the tandoor oven. Fresh fish cubes marinated in mild spices, skewered and cooked in the tandoor oven served with mint chutney. Succulent prawns in their shells marinated in mild spices, skewered and cooked in the tandoor oven. A combination of two pieces each of whole chicken marinated in lemon juice, ginger, garlic and exotic spices cooked in the tandoor oven. 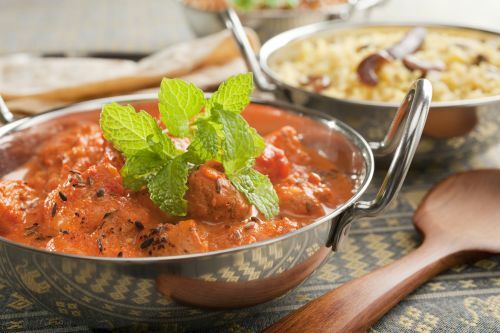 The ever popular – tandoori cooked pieces of tender chicken cooked in fragrant spices and a creamy tomato gravy. Boneless cubed pieces of chicken cooked in a delicately spiced creamy gravy of cashew nuts garnished with sliced almonds. Boneless tender chicken pieces cooked in fresh spinach gravy with fresh spices and herbs garnished with julienne ginger. Grilled pieces of chicken cooked in an onion, tomato, capsicum gravy garnished with coriander and capsicum. Tasty, hot and spicy curry to come out of Goa on the west coast of India - cubed pieces of chicken cooked in spices and vinegar and left to pickle overnight garnished with julienne ginger. Tender fresh diced chicken cooked in onion and yoghurt gravy with a scrumptious hint of mango puree. Boneless diced chicken cooked with fresh button mushrooms and chef’s own special spices. Tender chicken cooked in a dry onion and tomato gravy served with a hint of caramelised garlic. Boneless chicken cooked in an onion, tomato and coconut cream gravy garnished with shredded coconut. Choice of your meat cooked in a dry onion and tomato gravy served with a hint of caramelised garlic. Choice of your meat cooked in spices and vinegar and left to pickle overnight garnished with julienne ginger tasty, hot & spicy curry to come out of Goa on the west coast of India. Choice of your meat cooked north Indian style with herbs and spices and garnished with coriander. Choice of your meat cooked in an onion, tomato and coconut cream gravy garnished with shredded coconut. Choice of your meat cooked in a fresh spinach gravy with fresh herbs and spices garnished with julienne ginger. Choice of your meat cooked with pickled onion with a hint of cumin served with whole red chilies. Choice of your meat cooked with onions, tomatoes and delicately spiced cashew nut gravy. Fresh fillets of fish from the bay cooked with onion, tomatoes, herbs and spices garnished with coriander. Fresh fillets of fish cooked in a rich creamy gravy with subtle hint of coconut cream garnished with shredded coconut. Tasty, hot & spicy curry to come out of Goa on the west coast of India - cubed pieces of fish cooked in spices and vinegar and left to pickle overnight garnished with julienne ginger. Succulent shelled prawns cooked in mildly spiced creamy coconut sauce garnished with shredded coconut. Succulent shelled prawns cooked in a rich gravy with mushrooms, tomatoes garnished with coriander. All our curries are gluten free but few mains cooked mild, medium or hot and served with basmati rice. A north-Indian delicacy - home-made cottage cheese cooked in a dry gravy of onions, capsicums and tomatoes. Home-made cottage cheese cooked in a fresh spinach gravy garnished with sliced ginger. Potato cooked in a fresh spinach gravy garnished with sliced ginger. Home-made cottage cheese and minted peas cooked in a tomato and onion gravy garnished with coriander. Seasonal mixed vegetables cooked with chef’s own special spices garnished with coriander. White button mushrooms cooked with peas and chopped onions in a tomato based gravy garnished with coriander. A medley of seasonal vegetables cooked in a delicately spiced creamy gravy of cashew nuts garnished with sliced almonds. Tender succulent peas and potatoes cooked in an onion and tomato gravy garnished with coriander. Homemade cottage cheese cooked with creamy tomato, onion, capsicum and spices. Cauliflower florets and potatoes cooked in a tomato and onion gravy garnished with coriander and julienne ginger. Mixed lentils with mild spices cooked on slow heat till tender and buttered just before serving in a copper bowl. Potatoes and homemade cottage cheese mix with herbs and spices simmered with cream and cashew sauce. Whole meal oven baked bread. Bread stuffed and topped with garlic. Bread stuffed with lamb mince. Bread stuffed with spiced potatoes. Bread stuffed with spiced onions. Bread stuffed with cheese and cooked in tandoor oven. Bread stuffed with cheese and garlic. Bread stuffed with home-made cottage cheese. Bread stuffed with dry fruits and cherries. Layered and buttered whole meal flour bread.